Need a better Option? Focus on employment trends. According to the 2016 Department of Employment statistics, part-time and contract employment accounts for more than 25% of managers, professional’s, clerical and administrative jobs in Victoria. The trend is predicted to grow. Help us better understand the emerging employment trends in your company by taking 2 MINUTES to complete this simple survey. Take our 2 minute survey here. 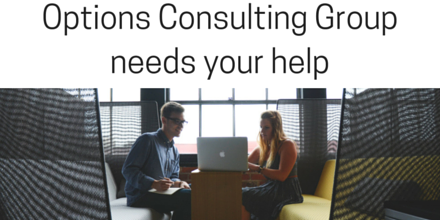 The data collected will enable Options Consulting Group to better serve our clients by understanding your needs.